With the update there came a lot more information about warmup before and stretching after the workout. Normally I just did around 75 Jumping Jacks and some High Knees (running on the spot) as it was written in my former coach. But now there is a set of 7 exercises that you can do to warm up and prepare your body for the workout. It is a combination of cardio-focused exercises (cardiovascular) like the before mentioned Jumping Jacks and High Knees and exercises that should activate your nervous system and the interaction of your essential body parts (neuromuscular). Some of them are available for free in the Freeletics Knowledge Center. I integrated the new warmup routine in my workouts and it feels great. Some of the neuromuscular exercises remind me of yoga positions – even they seem to be very simple, I can feel that they improve the coordination of the muscles. The warmup routine takes me about 7 Minutes to do. Be careful to not give all your power on the warmup, as a general rule of thumb you should give around 50% of your capacity. Stretching is a controversial issue. Some say it is as important as the warming up and that it helps to improve the flexibility of your muscles and to regenerate after an intense workout. It results in improved muscle control, flexibility and range of motion. Some say that is has no value and may even cause harm and weakens the muscle. Here is an interesting article about it. I did not do stretching so far, but I tried it this week. The update introduced 6 stretching exercises, some I already knew as they are basic stretching positions, some of them where new to me. You have to hold each position for about 45 seconds. The whole routine takes me about 7 Minutes. Maybe one week is a little bit to short to evaluate the effects of stretching compared to not stretching…but in compare to the new warmup routine I did not feel any differences. Anyhow the above linked article has some good arguments against stretching, I think I will do it sometimes after the workout. 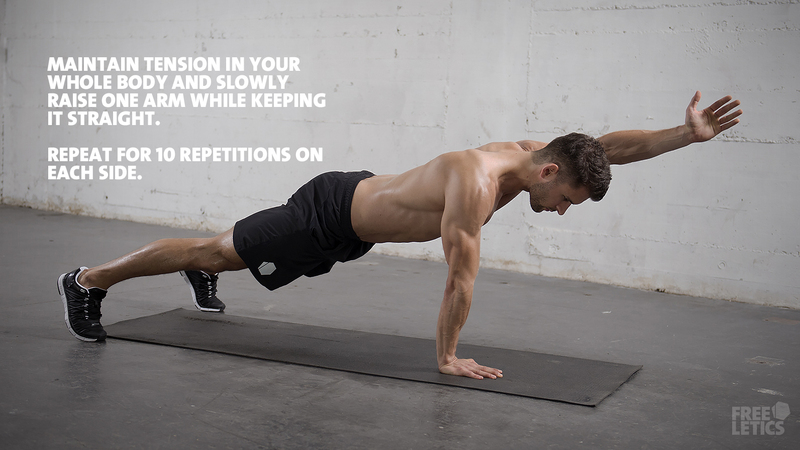 The Freeletics philosophy contains warmup and Stretching as key elements for sustainable success with high insensitive workouts and for what I experienced so far, they know what they are talking about. Due to the warmup and stretching the time I need to execute a workout is slightly increased. In total it takes about 14 minutes longer. I will see if I keep this up, as one of the things I like most about Freeletics are the short workout times and the great effectiveness of those. They allow me to maintain an athletic body without interfering with my work schedule and free time to much. Let me know how you do it! Do you do warmup and stretching?